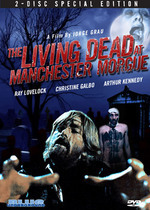 Blue Underground's Two-Disc "Living Dead at Manchester Morgue"
On February 26th, 2008, Blue Underground will be releasing a two-disc special edition of Jorge Grau's The Living Dead at Manchester Morgue,a film they previously released as a single disc under the alternate title Let Sleeping Corpses Lie. The new release will include a fresh widescreen transfer, Dolby Digital 5.1 English soundtrack (as well as a Dolby Surround 2.0 track and the original mono), trailers, TV and radio spots, a gallery of publicity materials, and interviews with Grau, star Ray Lovelock, and effects guru Giannetto de Rossi. 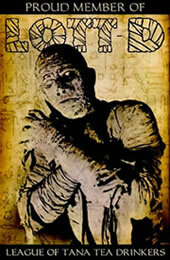 The Grau interview from the old Let Sleeping Corpses Lie release will also be included. Also out that day from Blue Underground are four Italian giallo films previously released by Anchor Bay: The Bloodstained Shadow, Case of the Bloody Iris, Short Night of Glass Dolls, and Who Saw Her Die?